Photo taken by Abby. I live in the Bay Area of California and am currently working through the birth of a beast, called Bipolar II. I am still learning about what it means to me to have a mental illness that has a name, but remains fairly hidden in my daily life. I am happiest when I am travelling, and my favorite self-care activity is taking my camera for a walk and focusing on what the frame shows me. I also keep a photo-blog that narrates the happenings around me that I find quirky, funny, or serendipitous. About this photo: Feeling stuck, I dragged myself outside with my camera, and this tree waved it’s wiry, limber arms at me. I saw baffling, inexplicable heartache. And I saw hope, because on the other side of this barrenness was a resilience, an aliveness, a potential energy waiting for spring. 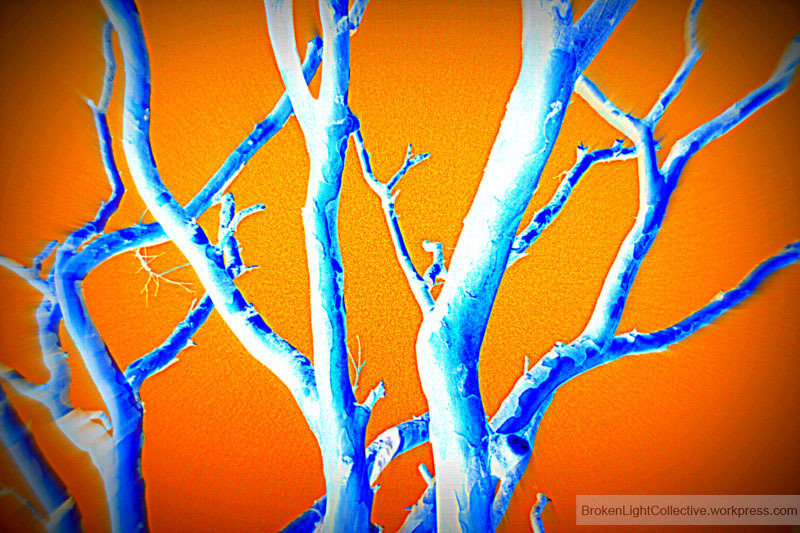 This inverted heat map version of the tree depicts the cyclical chill of the veins, even when surrounded by warmth. When the arteries choke, so does the heart. Living with bipolar depression means losing sync with the rest of the world sometimes, and losing touch with what matters most: the pounding pulse of our own remarkable selves. Seeking submissions for the Broken Light Collective. Send photos today. I reposted this on my blog. I really enjoy your optimism in the face of bipolar. Thank you for the photo and post. Thank you for your words of encouragement, and for the repost! I’ve had to stare at your photo for a long time to convince myself that the photo wasn’t changing. To me there is an optical illusion that the background keeps moving toward the center and the edges keep getting darker. Ruth, I agree with you. I think of that movement as the pulse of what makes us human, biologically and emotionally. what a great composition! thanks for sharing. Wow! That is one amazing photograph. Thank you for stopping by my blog. Your work is amazing. Please visit again. This entry was posted on March 17, 2012 by Broken Light: A Photography Collective in Bipolar, Mental Illness, Photography and tagged 365, acceptance, anxiety, anxious, art, art collective, arteries, beauty, bipolar, bipolar depression, Bipolar II, Bipolar NOS, blue, blues, borderline personality disorder, bpd, bright colors, Broken Light, broken light collective, camera walk, close-up, close-up nature, collective, color, colors, cooperative, creative, creativity, cyclical, cycling, depressed, depression, feeling stuck, freshly pressed, generalized anxiety disorder, happiness, happy, heart, hope, hospitalized, inspirational, inspire, inspiring, journal, love, mania, manic, manic depression, medication, mental, mental hospital, moods, moody, nature, orange, pain, panic, photo, photo challenge, photo walk, photography, photography collective, photos, pictures, post traumatic stress disorder, post-partum depression, postaday, ptsd, Seasonal Affective Disorder, self harm, soul, spring, suicidal, supportive, thoughts, togetherness, travel, traveller, trees, unusual, veigns, vibrant, weekly photo challenge, winter.